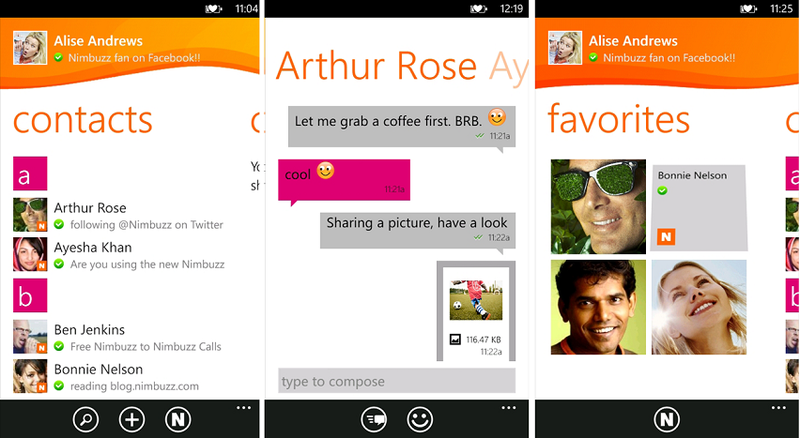 Great news for you instant messaging fans; Nimbuzz is now available to download in the Windows Marketplace. The popular cross platform app was a personal favorite of mine back in the Windows Mobile days and has also been a success on other operating systems. Now it is our turn on Windows Phone and the it will not cost you a penny to download. It is free. Free messaging - Replaces SMS with unlimited free chat. IM Community - Connect with multiple IM accounts and have them all in one list. Nimbuzz supports Facebook, Yahoo Messenger, MSN/Windows Live Messenger and Gtalk. Picture sharing - Click and share you favorite pictures with friends and family. Chat history - Keep your conversations handy for use later. Chat Buddies - Use popular chat buddies for Twitter, Cricket, Astrology etc. And much more - Guided tour, contact management, Presence management, Message typing indicator, N-Word, Free avatars and much more.